Not used as of this time. These adapters are great. I flipped the headers over, but I can see how someone might like them as they are. Either way, nice product. Adapters arrived today. I see the issue with the 6 pin header. I'm going to flip mine. My shipment arrived a week before it was due. Everything was soldered well and worked to specifications. Erin even personally signed my shipment. I love Addicore! convenient way to plug the board into sockets. The pins can be very carefully removed and replaced to a more useful position. Please consider moving the pins to the other side of the board.Other than that annoying inconvenience the board works as expected. Thank you for your product review. I understand the inconvenience if trying to use this module with something like a breadboard. These modules come with the male header pins already soldered on the top side of the board from the manufacturer. 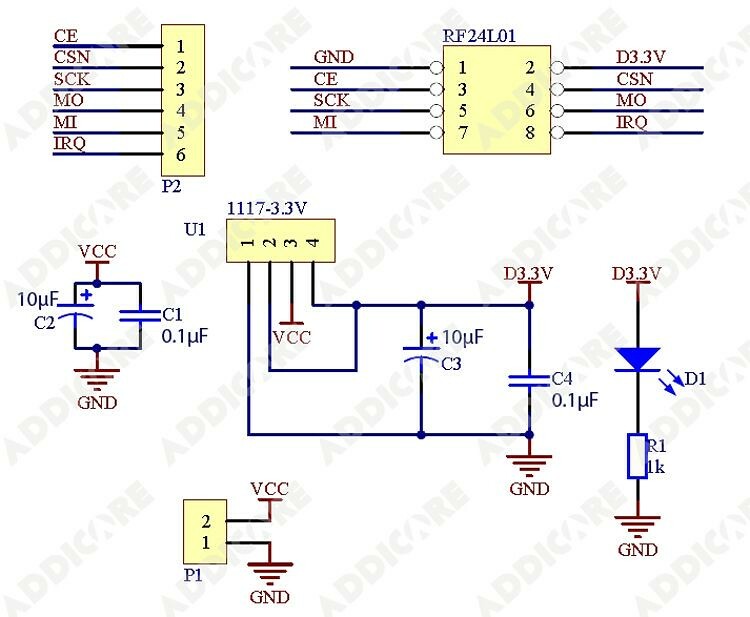 I would recommend our AD-BB-ADTR module which is a simple breadboard adapter we designed to make connecting an nRF24L01+ module to a breadboard easy and sturdy. A major difference about the AD-BB-ADTR is that it doesn't have an on-board voltage regulator.